I also had a prime spot near the entrance next to some super awesome peeps — on the right was crafty buds Sarah and Angela of I Like You. I was too slow to get one of Angela’s adorable scarf/hat combos — a “scart” I believe they were calling them. To our left was our entertainment — Andy and Micah of Campfire Goods. Check out their site for a load of Michigan (and Midwest) themed shirts — I already traded them for this one. 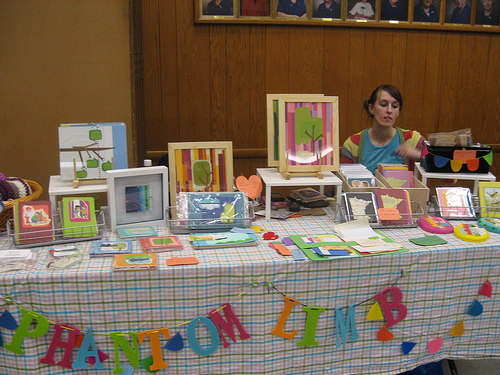 It was also great to chat with Reba, Fran of Zeichen Press, the ladies of Rectangle Design and Oona of Run Amok. I’m still regretting hesitating and missing out on a handpainted Wooden Folk figure (they don’t seem to have a site), but I did score some adorable stuff at Studio Mela’s booth. I had sold a lot and was worried many of the shoppers would be the same from the day before. This was a silly fear — One sweet lady said she couldn’t stop thinking about my stuff and had made the trek in just for me. Awesome. 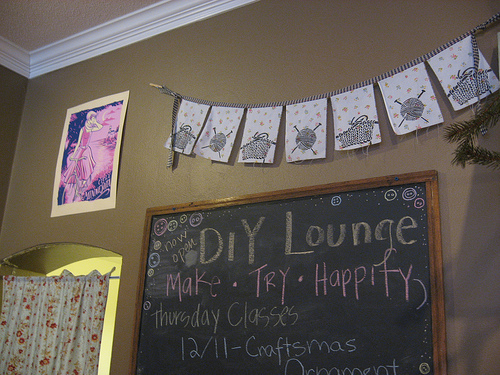 The next day we headed to Truly, an indie design store in White Bear Lake. 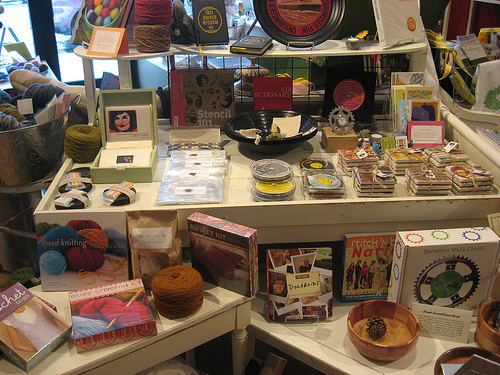 Pardon the pun, but this store is truly adorable, carrying everything from crafting books and supplies like handspun yarn to the finished products of local and national artists. 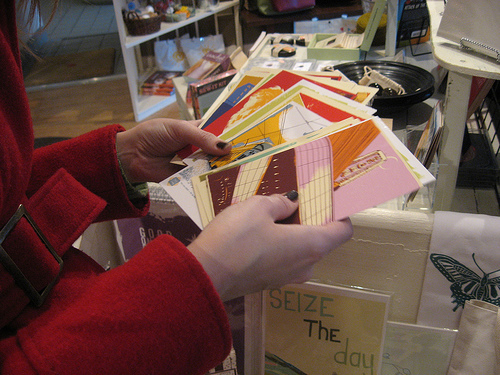 We picked up a few of Minneapolis artist Adam Turman’s postcard prints as well as some of our Christmas presents in the store. 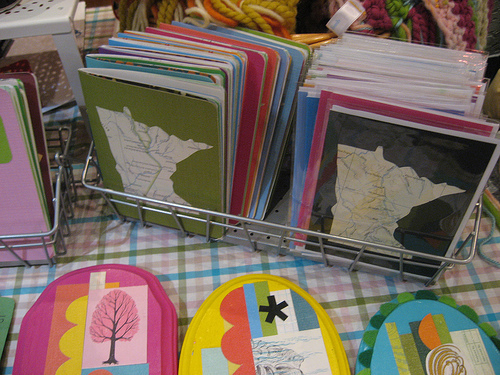 Right now it’s the only place you can buy my Minnesota map cards and journals pictured at the top of this post. 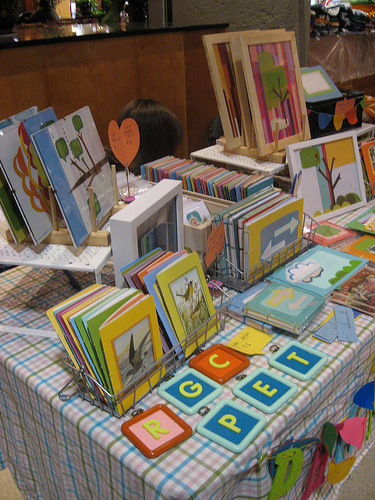 Next up in my crafty adventures: I find my new favorite place on earth and blow all my money on art comics and zines. Glad to hear you had a good time. After seeing your Michigan map journals, the Minnesota ones are awesome in that familiar-but-different kinda way. Cool!